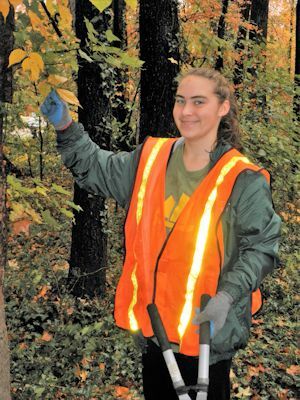 Fifteen enthusiastic volunteers helped rescue trees from invasive plants on a drizzly Sunday morning, November 5, 2017, working in the marsh along the bicycle path across from Tulane Drive. They tackled English ivy, porcelainberry, clematis/Virgin’s bower, honeysuckle and bittersweet, most of which can threaten the survival of many trees and shrubs. The trees and shrubs targeted included oaks, hollies, sassafrases, hornbeams, blackhaws, viburnums, spicebushes and strawberry bushes. One plant example of invasives’ harm to trees: English ivy can accelerate rot, weaken branches through its weight and prevent light from penetrating leaves. It competes with the tree for nutrients and water. In the photo at left, Kahil Mulla, a Carl Sandburg student, and Katherine Wychulis remove English ivy from a tree. This part of the Dyke Marsh Wildlife Preserve has many mature trees and many young trees trying to regenerate. 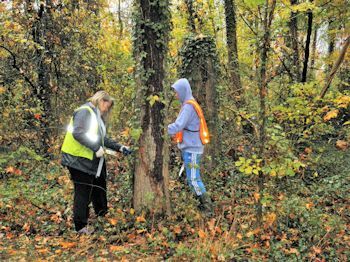 Trying to control these rampant invasives is a long-term, daunting undertaking. Mimi and Will Friedman helped remove English ivy from many trees. Cameron Mulla, a Carl Sandburg student, came out with her family. 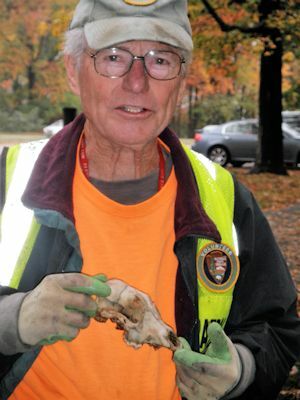 In addition to bottles and cans, volunteers found a deer skull, held by FODM Vice President Ned Stone. 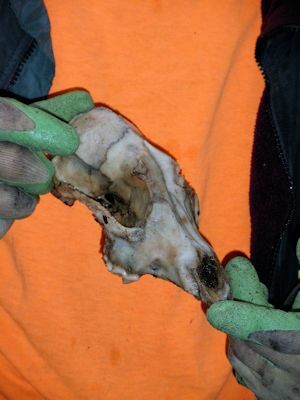 Deer skull found by volunteers.